Handbags that come through in a clutch - Susan Said... WHAT?! I am a huge fan of handbags of all kinds. I have huge straw totes, bags cleverly disguised as lunch boxes and fishing tackle baskets – I once even had a bag whose design was based on a Swiss gas mask bag (in retrospect, one of my darker periods). But I must confess that I have a deep and longstanding love affair with clutch bags. There’s something so simple and elegant about a tiny envelope bag tucked under the arm! Clutches are the perfect size for lunch out with the girls, a night on the town with my guy, or a day of shopping. Clutches also force me to selectively edit what I carry. And if you are anything like me, the jumble that collects in some of my bigger bags can be downright alarming! The only downside of the clutch bags is there is often no “hand-free mode.” Luckily for us, handbag designers have increasingly taken this basic need into account. So now, we can carry a clutch to a cocktail party, hold a drink and shake hands with the bosses’ wife – all at the same time! 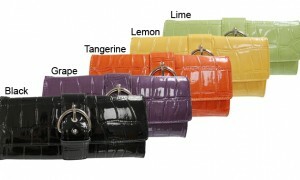 Some of the best I’ve found include an extremely affordable wristlet in a trendy embossed mock croc by Adi Designs. I have this in lavender and love it! This seemingly tiny bag has a surprisingly roomy interior, inside and outside zipper compartments, clear ID window, removable card holder and coin purse. Best of all is the highly useful end wrist strap! In addition to lavender, this bag also comes in lemon, lime, tangerine and black. And at only $19.99 at www.overstock.com, you can afford them all. A more upscale version comes from one of my all-time favorite designers, Tommy Hilfiger. His classic American style means that a Hilfiger purchase is really an investment, because it simply won’t go out of style. Of his fabulous handbag collection, my favorite is a sleek black clutch bag in patent leather. The elegant, stylized tortoiseshell finished handle is cleverly designed so that you can easily slip your wrist through it, should you need to use your hands. Beautiful and practical! $128 at www.purses.com. My ultimate clutch bag is from the Cocktail Collection at Butler Bag. Made of crushed Italian leather, this high-end bag is a favorite among celebrities and is no stranger to the red carpet. Like all pieces from Butler Bag, the interior compartmentalization speaks to my ever-present need to try to stay organized. For me, the best part of this bag is the way that you can carry it. The clever outside strap — which you slide your palm through — means you’ll never drop this beauty climbing into a taxi! At $800 from www.ButlerBag.com it’s a major splurge, but oh-so-gorgeous! Separator image Posted in WOMEN'S FASHION and tagged with Adi Designs, Butler bag, clutch bag, handbag, Susan Conforte McNeill, Susan Said What? !, Tommy Hilfiger, women's style fashion beauty. Jingle, jangle… love that bangle! 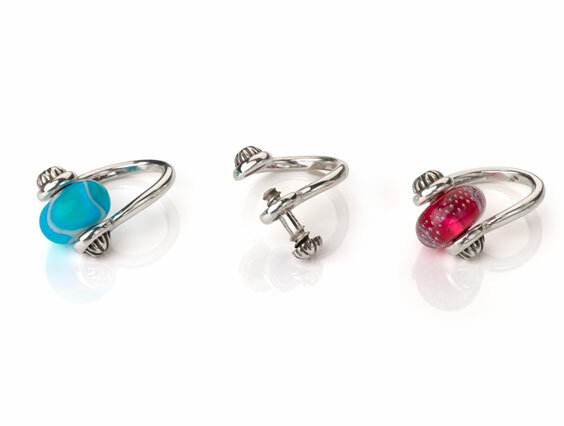 Everyone needs a little WHIMSY… jewelry, that is!